Looking for an indulgent and easy recipe? Look no further as I’ve got you covered. This one is especially great during this busy period where you don’t really want to spend to much time in the kitchen. Within 15 minutes you are ready to pop this baby in the oven and you are set. 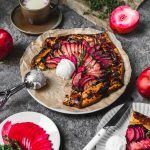 This galette makes the perfect dessert during your holiday meals. Cinnamon is a delicious warming spice that comes to great use, and pairs exceptionally well with the apples to perfect little treat. We are cheating and making it super easy for ourselves by using store bought pie dough, but feel free to make your own. As I’m becoming more busy I found this to be super convenient and I’m sure many of you can relate. Especially during a dinner where you are preparing more than one dish. As for apples I went with these red love apples that are pink on the inside as they add some lovely colour to the dessert. If you can’t find them feel free to use any apple you can get your hands on. Top top everything off I used some lemon thyme, again optional. Use any kind of thyme or skip it all together. I also added some coconut ice cream to turn this already indulgent treat into the ultimate guilty pleasure. It’s the holiday season so it’s time to live it up. It’s time to hop into your kitchens and start living your bests lives! 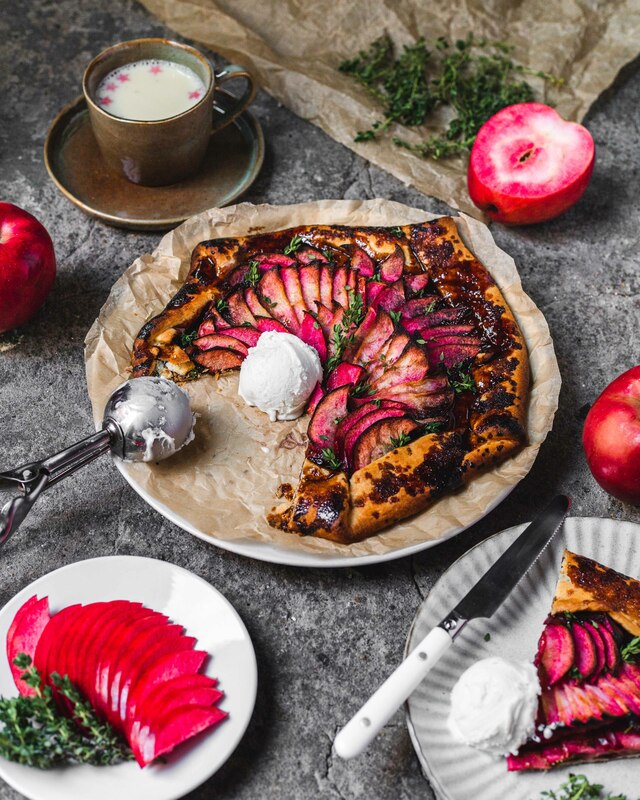 We're saving time on dessert with this delicious apple cinnamon galette. Delicious, simple and quick. Preheat the oven to 175 celcius or 350 farenheit. 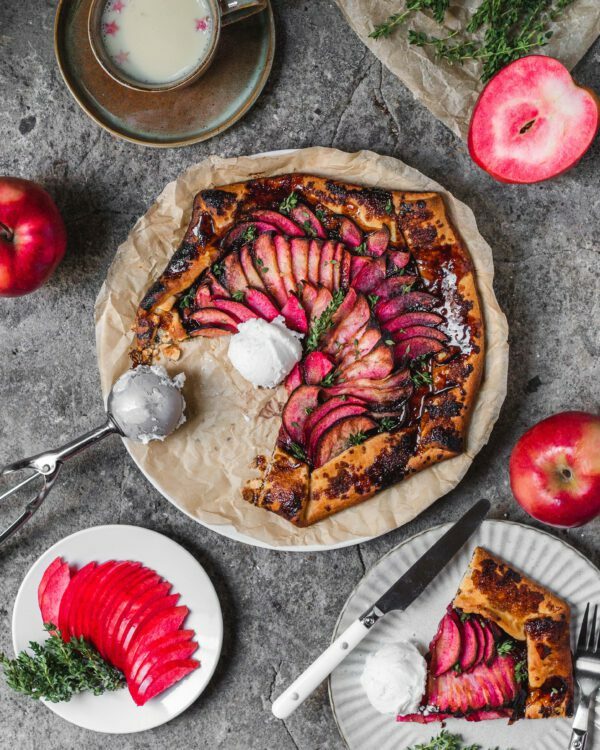 cut the apples into small wedges so you can easily place them on the pie dough. Roll or place the homemade, or store bought pie dough on a piece of parchment paper and spread the vegan butter or margarine in the middle, leaving about 2 inches on the sides free. Sprinkle the cinnamon and brown sugar on top of the middle of the pie dough you just covered. 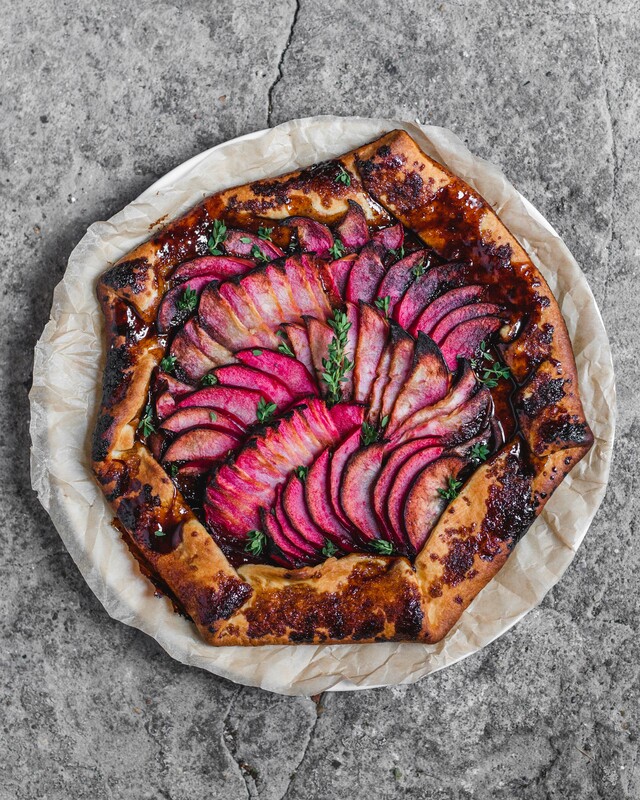 Place the apples on top of the middle in your own design and fold the edges on top of the apples to close the galette. Optionally add some vegan butter and brown sugar on top of the edges before placing in the oven. Bake in the oven for about 25 minutes or until the sides become golden brown. Remove from the oven and let it cool or have it warm. Optionally serve it with your favourite vegan Ice Cream. Enjoy.